Blah, Blah, Blah...: Interview & Giveaway with Janice Hardy! Well, we have a special guest today at the Blah, Blah, Blah Blog -- author Janice Hardy! Janice is a voracious reader, which used to get her into a lot of trouble in school. Eventually, she figured out writing stories in class made it look like she was doing actual work, so her teachers left me alone. Since then, writing has worked out way better than algebra ever did. She now writes young adult fiction and no one ever tells her to cut it out and pay attention anymore. 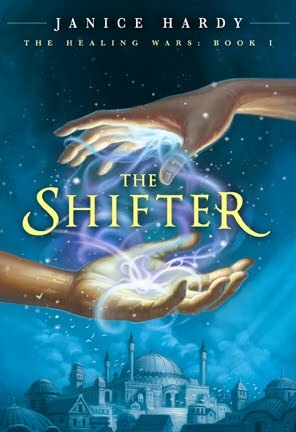 For her debut fantasy novel, “The Shifter”, she tapped into her dark side to create a world where healing was dangerous, and those with the best intentions often made the worst choices. She lives in Georgia with her husband, three cats and one nervous freshwater eel. Q: An eel? Really? Wow. Okay, we’ll get back to the eel. First, though, in your debut MG fantasy novel in your Healing Wars series, “The Shifter”, we meet Nya for the first time. How did you come up with her? A: I knew I wanted someone with the pain shifting ability to be the protag, but it wasn’t until I did the world building that Nya came to be. I needed to understand more about the world before I could put someone in there and make them suffer (which is very important to me as a writer). She evolved as I wrote that first book and learned more about her. Q: Can we get a small taste of “The Shifter” for those who may not have read it yet? Stealing eggs is a lot harder than stealing the whole chicken. With chickens, you just grab a hen, stuff her in a sack and, make your escape. But for eggs, you have to stick your hand under a sleeping chicken. Chickens don’t like this. They wake all spooked and start pecking holes in your arm, or your face, if it’s close. And they squawk something terrible. The trick is to wake the chicken first, then go for the eggs. I’m embarrassed to say how long it took me to figure this out. “Good morning little hen,” I sang softly. The chicken blinked awake and cocked her head at me. She didn’t get to squawking, just flapped her wings a bit as I lifted her off the nest, and she’d settle down once I tucked her under my arm. I’d overheard that trick from a couple of boys I’d unloaded fish with last week. Two words I didn’t want to hear with someone else’s chicken under my arm. Q: ROFL, I love it! 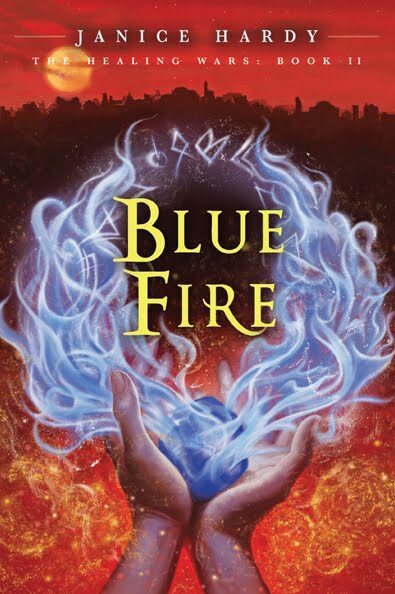 The second book in this series, “Blue Fire” releases on October 5th in hardcover. What’s new for the characters in this book? A: They get to travel some (not all of them willingly) and Nya has her world view turned upside down. It was a lot of fun to write because Nya has a very small focus of what her world is like, and the world in general. She “knows” her right and wrong, friends and enemies, and those beliefs are challenged quite a bit in “Blue Fire.” Being able to push a character that far outside their comfort zone let me do a lot of interesting things with her. Q: Is your Healing Wars series a trilogy or do you see it going on beyond three books? A: Just a trilogy. Every once in a while I wonder about a prequel that deals with the war Nya lost her parents in, then think, “Nah.” A short story, maybe, but it’s not enough for a whole novel. Q: You have distinctly different US vs. UK covers and titles for the first book. The blurbs for both are also distinctly different. Why was that, and will it be the same for the rest of the books in this series? A: There are two different teams working on the covers and the blurbs, one in the US and one in the UK. What works for the one country doesn’t always work for the other, and they write/design what they feel will best sell the book to their markets. The US team wrote something new for “The Shifter” cover blub, but the UK team pretty much used my original query letter. Both used “Blue Fire” as the tile for book two, but this time the US team used the blurb I sent in, and the UK wrote something new. The UK also redesigned the covers of both books and they look amazing. So far, it looks like book three will be the same title for both, but different cover art. I’ve seen early sketches for book three and it looks awesome so far. Q: I can relate to the joy of having awesome covers. So, other than Nya, who’s your favorite character in the series, and why? A: I’m a huge fan of the bad guys, so Zertanik the pain merchant is my favorite from “The Shifter,” and a new character, Vyand, is my favorite from “Blue Fire.” Zertanik is fun because he’s so irreverent and practical, even though what he’s asking for is horrible. Vyand is similar in that she’s just doing her job, and she actually likes Nya a lot, despite what she’s doing to her. I also have a soft spot for Nya’s best friend, Aylin, because she always seems to get the best lines. 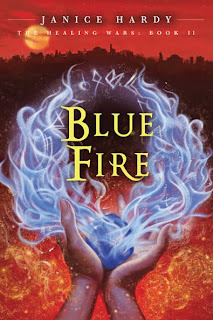 Q: Could we get an excerpt of “Blue Fire”? I’d hate myself more if I let another chance to find Tali pass me by. I reached out a shaking hand out and wrapped it around his arm. Felt my way in. Similar wounds, but lower, piercing the liver, stomach. I stopped the bleeding, eased the shock. Fresh pain cut though me and I slumped against Danello. “As—” My throat wouldn’t let the words out. I tightened my grip and pushed, just a little of his pain back. He screamed. I took a deep breath and gathered the pain in the hollow space between my heart and guts, held it there as best I could. Q: Love it! You scored the author’s “ultimate”, a hard/soft deal. What was that like, and how has it affected your writing, deadlines, promotion, etc.? Having a deadline is both a blessing and a curse. It’s highly motivating and makes it a lot easier to make writing a priority. But it can put a lot of pressure on you if the writing just isn’t going well for whatever reason. I’ve always worked in deadline-heavy jobs (I’ve been a graphic designer for ages, with print deadlines to keep) so I’m comfortable with them. Promotion has been new for me, and that’s been the biggest challenge. Like a lot of writers, speaking in front of large groups of people scares me, so I’ve had to overcome that for book signings and school events. They’re a lot of fun so it’s worth it, but I’m always a nervous wreck before them. I also feel bad about “pestering” folks about my book, but networking is all about making contacts and reaching out to strangers. Q: When is the third book coming, and what’s its title? What can we expect for Nya and the other characters in this book? A: October 2011. Right now it’s called “Darkfall,” (I think this is the first time I’ve ever said that publically) but the way my titles have gone, I would not be surprised if it changed. As the final book of the trilogy, it’s deals a lot with the war between Geveg and the Duke, and how Nya and her friends fit into that. Q: Oooh, we got a scoop! Awesome! 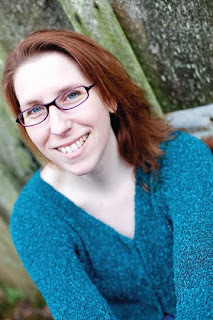 So, what do you like best about writing for an MG audience? A: The freedom to do just about anything. Kids have great imaginations, and while they have well-defined BS meters, they’ll go with you anywhere you want to take them if you do it right. There’s also a wonderful sense of immediacy with MG fiction, because kids can get totally in the moment so much better than adults. Grownups have too much baggage and part of our brains are always thinking about the mundane stuff. Or at least mine is (grin). Q: I see we both have pink laptops. Excellent choice! So, are you an outliner, linear writer, or scene sewer? A: Outliner for sure. I need to have a general plot structure with my major turning points to help keep me focused. But within that structure, I let my characters run free. I always know where I’m going, but rarely how I’ll get there. This combination keeps me on target but still lets me be spontaneous. I do like to write linearly, since where my characters are at emotionally really dictates what they’ll do in a scene. Q: Morning or evening, chaos or solitude, music or silence? What’s your perfect set up for writing? A: I’m a morning person, so I usually hit the keyboard around 8am, and write until about 11am. If I’m on deadline (and have the time), sometimes I’ll write in the afternoons, but I’m most creative in the mornings. I like silence and solitude (except for the cats) since I get distracted easily. I don’t like to write every day though, or I get burned out. I prefer to write for a few days, then take a day off. Sundays I don’t work on my books at all, but I do write my blog posts for the upcoming week. Q: So we’re exact opposites. No worries, your odd working habits will not affect our friendship. Your career seems to have been mainly arts-focused. Do you still do design work, or are you writing full time? A: When I went off to college, I knew I had only two real skills. Writing and design. I figured I’d starve a lot faster as a writer than a designer, so I went to school for that. It worked out well, actually, and I still do both. I write in the mornings, then after lunch I work on the design jobs. Both sides have odd schedules, so I’ll have weeks where I’m swamped and weeks where I have nothing to do. Q: You’ve SCUBA dived and skydived. What’s the next dive ‘thing’ you’re going to master? A: Ooo good question. I really don’t know. What others are there? I tried regular old springboard diving as a kid, but hitting the pool from high up hurt. I’m also way too klutzy to do it well. Q: Sadly, I can relate to the klutzy. Favorite musical artist? Q: Love her music, too, so nice choice. Now…an eel? Really? Ho do your pets stack up against mine, The Killer Kitties and The Canine Death Squad? A: I have three cats, and Eelbert the Eel. With those monikers, I think your pets could take mine any day. But my Nikita could smother you with kitty love. Or just smother you. She’s quite the butterball. Q: She’s like my Dementia Kitty, then, at least in terms of size. So, the big question: What’s one thing about you that someone who hasn’t read this interview wouldn’t know? Well, if that doesn’t show exactly why I love you, nothing will. Plus, zombie love is definitely going to endear you to a large chunk of the Alien Collective. So zombie and alien lovers alike, if you want to find out more about Janice and her awesome series, check her out on the web. Janice, thank you so much for being here today. And, thank you even more for what I’m about to announce! Contest is open to anyone who leaves a blog comment or question for Janice and also leaves their email addy so we can get in touch with you. Contest is international, and will run through Wednesday, October 19th. Winners will be announced by Monday, October 25th. OMG!!! I HAVE TO WIN "THE SHIFTER". Let me win!! PLEASE!!! LET ME WIN!!! So please enter me for the contest! You mean I could win BOTH???? I really enjoyed the interview and I'd love to hear the story about how having an eel for a pet came about. I'd love to win a copy of Shifter, so I could start the trilogy at the beginning, but I'm looking forward to reading Blue Fire as well. Oops, sorry about that, I meant THE Shifter. I sent before I proofread. Now you're a person I can talk to. Zombies rule! I would have thought I'd have figured out your zombie love after lurking around your blog, but it's news to me. I LOVED the excerpt with the chicken!- as did everyone else apparently! That was such a fun interview! I sometimes get bored when I read some but I enjoyed this very much! I've been following Janice all over the internet this week. Mostly hoping that her talent will rub off on me, but also to see if I could WIN HER BOOKS!!! simply LOVED The Shifter. And simply NEED to read Blue Fire! I'd love to read these books. They sound great! Awesome...I want Blue Fire!!! I feel like a stalker...LOL. This blog tour has been great. Barbara E., I'm a scuba diver, and I always wanted a moral eel as a pet. But saltwater tanks are really hard to manage, so we have freshwater instead. One day, my husband was at the fish store and saw a freshwater tire track eel. He brought him home as a surprise, and I've had eels ever since. Although right now, Eelbert keeps hiding under the gravel and barely comes out. He's usually so active! Love the covers. I'd love to win. Hi Janice! i was wondering why is your freshwater Eeel so nervous? He has three cats who love to lay in front of the tank and bat at him. He messes with them, though. Some days he tucks his tail on a plant and bobs in the current like a stick. The cats just don't know what to make of it. Is it real? Is it fake? Pretty funny to watch. An eel...okay to close to a snake for my liking. Thank u for stopping in to chat with us. My question to u is simple...what item in your purse would make a totally unexpected weapon against a zombie attack and how would you use it? We have to be prepared for anything. Oh this looks like an amazing series! My question is do you have experience with chickens? After the quote of the book involving hens it got me to thinking. What one thing do you always try to put off? Teril, I grew up with horses, and there were a lot of chickens at the ranch. I had one who made her nest in a bale of hay in my tack room. Every time I went in to feed my horses or get tack, she'd eye me like I was committing a home invasion. I named her Camilla after the Great Gonzo's girlfriend in The Muppets. JennyWrens, emptying the dishwasher. I can't stand emptying it, but I don't mind loading it. It's kinda weird. I loved reading the interview. I'm also a zombie lover so can identify. I used to fight like heck to be allowed to put one on the front porch in a lawn chair around Halloween. I'd love to see this backyard Zombie, Janice. Sounds so cool!Thanks for the opportunity to win a book. awesome interview and love those covers.I do love a good zombie story. I thought I left a comment here! My bad! Sheep brain fry. So how does one spoil an eel? Are there special eel treats? Eel toys? Eel tank accessories? KatieA, I spoil my eel by giving him his favorite yummy treats. I'd go into more detail, but some of what he eats is kinda gross if you find this comment first thing in the morning over coffee, LOL.